60/55 durometer, shore A SBR rubber lagging is bonded directly to the pulley rim. Chevron, Herringbone and Diamond Groove are all available. 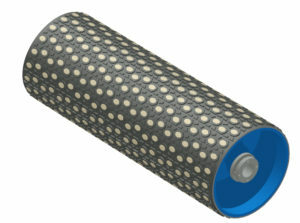 Rubber lagging with a smooth finish can also be supplied. If grooving is required, direction of rotation is required. 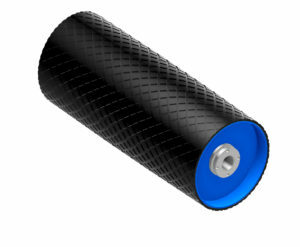 Also Available: Neoprene, Urethane, Roughtop, and Ceramic. The Slide-Lag formula provides specially compounded elastomer padding vulcanized under high pressure to heavy gauge steel plates which are shaped to conform to each pulley diameter. 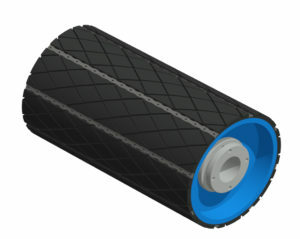 Exclusive elastomer compound provides a lagging pad with exceptional drive pulley traction, which is abuse resistant and has extra long service life. Pressurized hot vulcanization assures the best possible bond of rubber to the backing plate and no lagging failures from loss of adhesion and separation. Steel backing plates are dye stamped to fit the specific curve of each pulley diameter, ensuring proper pad stability and long life. Rust resistant metal retainers are welded to the pulley face to securely hold the lagging pads in place. Properly installed, Slide-Lag will not shift or pull free. 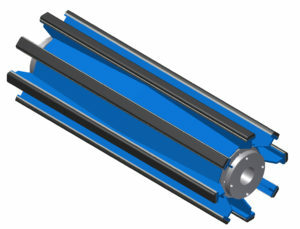 Slide-Lag can also be installed on the job, usually without removing the belt or pulleys. Standard 60 Durometer 1/2"-thick industrial compound Slide-Lag in stock. Also available: Oil Resistant, Heat Resistant, Flame-Stop, Stainless Steel backing plates and retaining clips, and heavy-duty 3/4" pads. A blend of natural and SBR vulcanized to a 12-gauge steel channel. Engineered for maximum traction in both directions, allowing Luff Wing Lagging to be utilized on reversing belts. 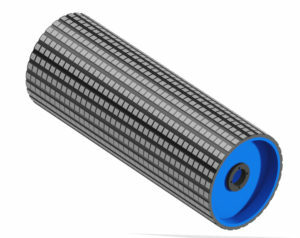 Luff Industries has partnered with Richwood Molded Rubber Products to provide top of the line ceramic lagging on Luff Drum pulleys. Combi-Lagg and Combi-Grip lagging uses Richwood R2000LS premium rubber compound and ceramic tiles with raised nubs to provide maximum grip, preventing belt slippage.